We are slowly working our way through the variety of ways to see the rainforest. Admittedly, some of them are over-the-top touristy, but there you are. No other way to walk the canopy, for example, than to work with a company who owns the walk. So we bit the bullet and went for another touristy bit, a small “steam” train with open cars through a primary (virgin) forest. It was lovely. This outfit, Train Forest (yes!) is either seven or three months old, depending on who’s telling the story. Part of the land they own is reclaimed pastureland. A big environmental problem here in the mountain rain forest is not only coffee growing, but cattle. Costa Rica prides itself on its dairy/cattle business, but environmentalists have pushed back, and in this rain forest/reserve zone, some of the pastures have been re-converted. But for Train Forest, most of the land is primary, uncut forest, lush, thick, amazing. Resplendent Quetzals are often spotted there, but we’ve not seen one. We did see a strange little critter that looks sort of like an anteater called a coati. 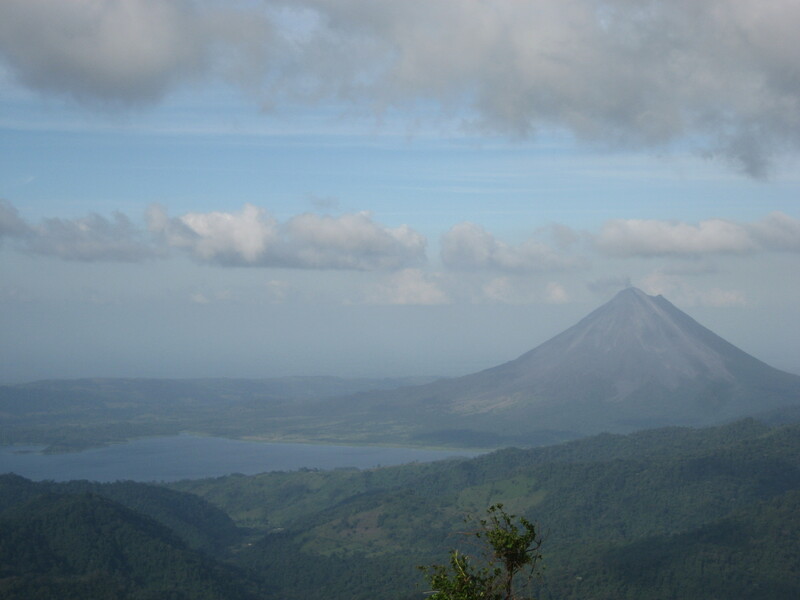 But mostly, what amazed us at the end of the rail line was a fabulous view of Arenal. Like Mt. Rainier, it can go in and out of visibility often, and you can go to see Arenal many times without succeeding. But we not only saw the steep rain forest leading down to Lake Arenal (with a dam for power producing) but the great volcano itself, smoking. More than that, we heard it…a roar that gets your attention. On a really clear day, you can see to Lake Nicaragua, across the border. Arenal was thought to be just a mountain arising from the plains of Alajuela until 1968, when it blew, and around 80 people were killed. It’s roared and shaken and smoked since then, and at night, they say, you can often see lava pouring over its side. There are towns near the base on the other side, and it’s a big tourist attraction with a lot of hot springs thrown in for good measure. When you ask if it’s going to go off again, people give you a big Si, and shrug, as if to say, Of course, what do you think? It’s a volcano isn’t it? But nobody seems very concerned either. Going to see the train, I made a classic weather mistake. I dressed for only one climate — the warm sunny one that prevailed when we left. 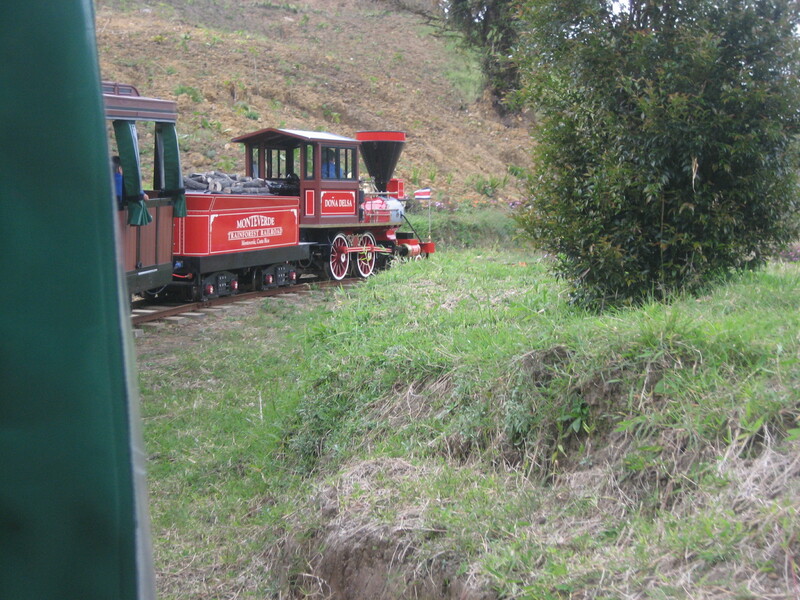 Well before we got up there, the cloud part of the cloud forest blew in, and the train being open, I basically froze. After the train ride, we were so enchanted with the beautiful, new sort of “mountain lodge” they have built with a gorgeous glass-enclosed restaurant, that we decided to have dinner there. With the request that the open doors get shut. They were, and the clouds and wind slowed the rate that they blew in. The view watching the clouds swallow the mountains and the sun reflect red off the clouds sunk in the valleys was stupendous. So was the dinner. Once again, first class food in surprising places in Costa Rica. You might think that the Big World Event yesterday was the Super Bowl, but in Costa Rica at least, you would be wrong. At least mostly. Yesterday months of electioneering culminated in a vote. Weeks ago in San Jose we saw fans of one candidate or another marching around wearing matching T-shirts, paper hats, and making noise rather like a pep squad. 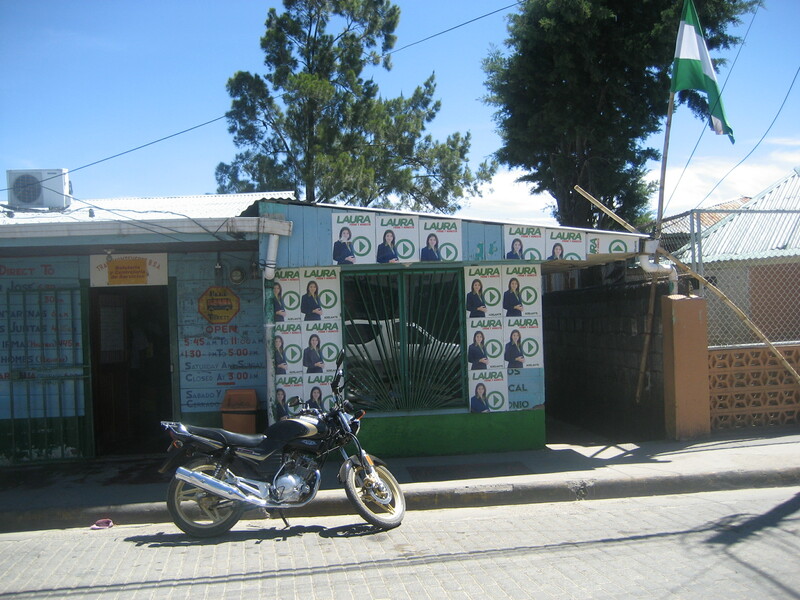 Around the country we have seen campaign headquarters, seen posters, heard speeches, mostly supporting Laura, as she is called by everyone, Chinchilla. She was favored to win, and she did. The first woman president and the heir apparent to Oscar Arias. When asked why they supported her, many people told me because she would continue with his policies, namely: fixing roads (! ), continuing to support schools and scholarships for poor kids, and fighting the increasing problem of narco-traffic coming into Costa Rica. OK, so Super Domingo, right. Given all that, you might think that on such evening news as I could find tonight, they would be all over this story. But you would be wrong. On the only station that came , the inbroadcast dude was talking about…the SAINTS. Not only that he was trying to march and dance around as if he were the King of Mardi Gras.